This is our personal home computer. It originally came with 1 meg RAM, a 40 meg hard drive, and a single speed CD-ROM which didn't even reach MPC1 levels. 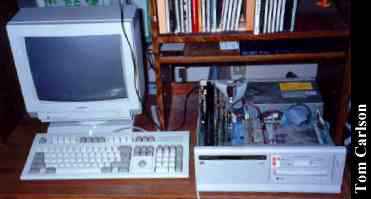 Later, it had 3 megs RAM, a 2400 baud modem and an old 8 bit Sound Blaster. The CD-ROM no longer spins up. You can't run Windows any slower than this! Click here to view all comments for the Magnavox Magnum16-CD and to leave your own. Click here to view comments about other Magnavox computers.